I’m seriously thinking about suicide. What should I do? If you are thinking about suicide, you are not alone. Many people have thoughts of suicide, for a number of reasons. Thoughts of suicide can be very scary. You probably feel hurt, confused, overwhelmed and hopeless about your future. You may feel sadness, grief, anger, guilt, shame, or emptiness. You may think that nothing can be done to change your situation. Your feelings may seem like they are just too much to handle right now. 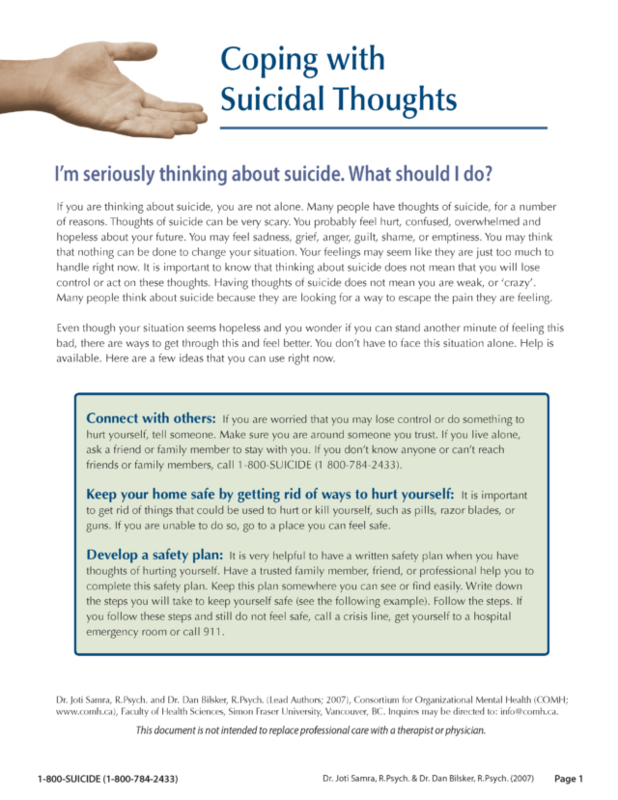 It is important to know that thinking about suicide does not mean that you will lose control or act on these thoughts. Having thoughts of suicide does not mean you are weak, or ‘crazy’. Many people think about suicide because they are looking for a way to escape the pain they are feeling.